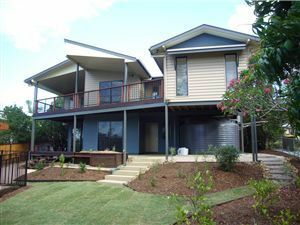 Bardon, a Brisbane suburb 7km from the city centre, is a neighbourhood consisting of mainly traditional Queenslander houses. This case study examines one Bardon residence, a new 310m² two storey house, developed on the 150m² footprint of a former post war brick house. The Bardon residence was one of the latest and more remarkable Sustainable Housing projects, with 98% of the materials recycled from the existing brick house. The new Bardon residence was designed to use the natural conditions of the site while blending into the neighbourhood. Natural ventilation creates a comfortable and healthy indoor environment, and mature trees provide natural shading; windows, openings and indoor/outdoor areas are placed to ensure sufficient natural light and create transition spaces from inside to outside. Solar hot water system provides hot water and the solar PV electricity back to the grid. Under normal circumstances when a house is demolished and a new one is constructed, the old materials are taken to landfill. It is estimated that the construction industry is accountable of 80% of landfill by weight and up to 44% by volume, when constructing, renovating and demolishing (Birkeland 2008, 64). The Bardon residence is proof that design and construction of a modern family house, Sustainable can reverse the waste process and use most old materials in an innovative way. The increased focus on sustainable housing solutions and green architecture was important for the future and further development of these concepts. For both clients and architects it is necessary to work together with the counterparts in a greener direction. And in business terms sustainable construction today is still low in both supply and demand. Initiatives and companies like Sustainable can be key stakeholders in reversing the process of waste and developing sustainable design trends. This case study focuses on the sustainability principles, their benefits and costs. The advantages and disadvantages for choosing these solutions will be examined. Sustainability is not about sacrifices – it is about better planning and management as well as working with the environment, not against it.